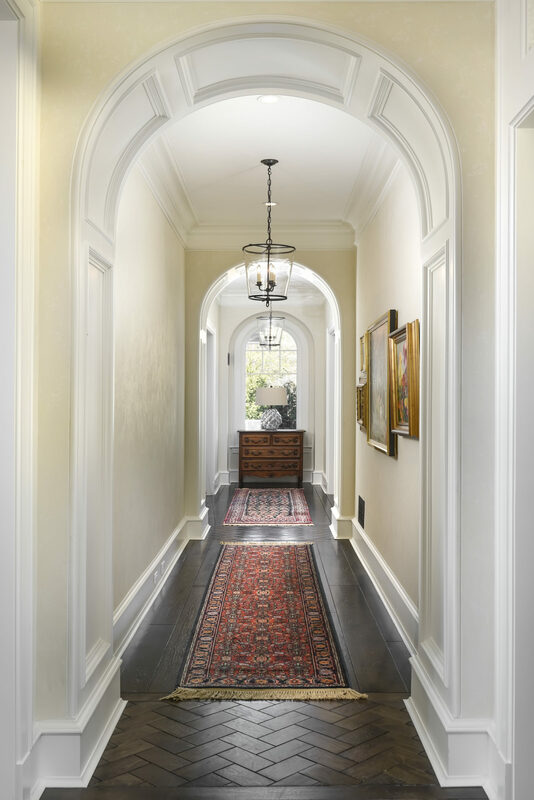 Morgante Wilson Architects made this grand entrance inviting with the use of a custom onyx topped foyer table. 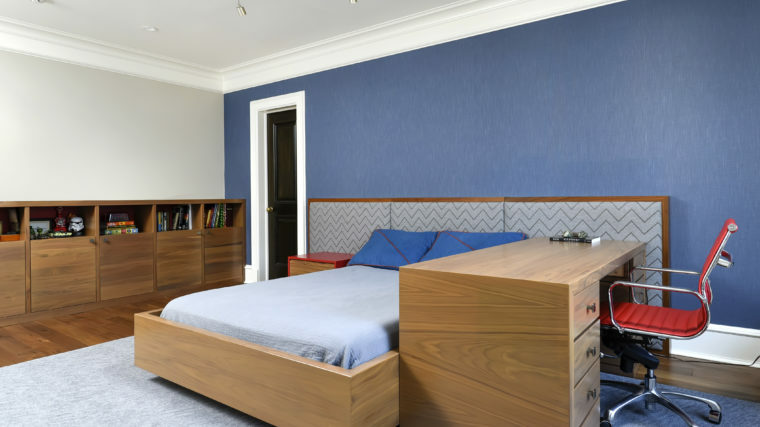 The niche is covered in Galbraith & Paul wallpaper with Formations cabinet. 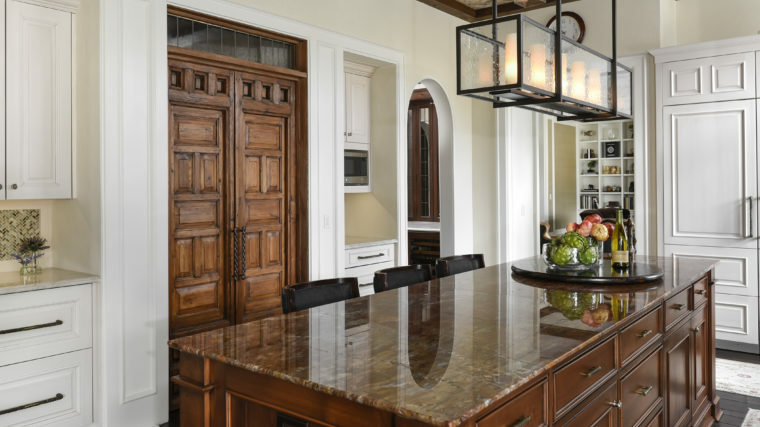 The custom David Iatesta chandelier used the volume of the double height ceiling to its advantage. 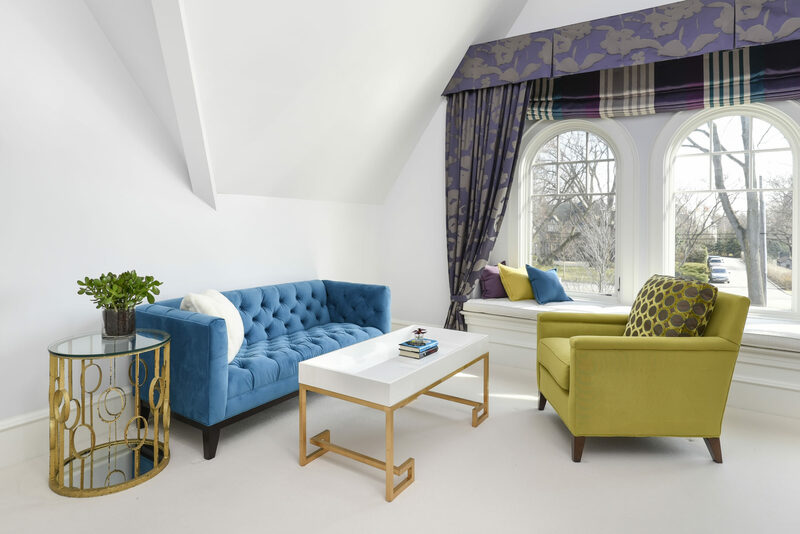 Two seating groups were used to help define this large Family Room. Ironies lounge chairs covered in leather and fabric offer a intimate conversation space. Sliding mahogany doors with seeded glass offer the option of creating a private entertaining space. 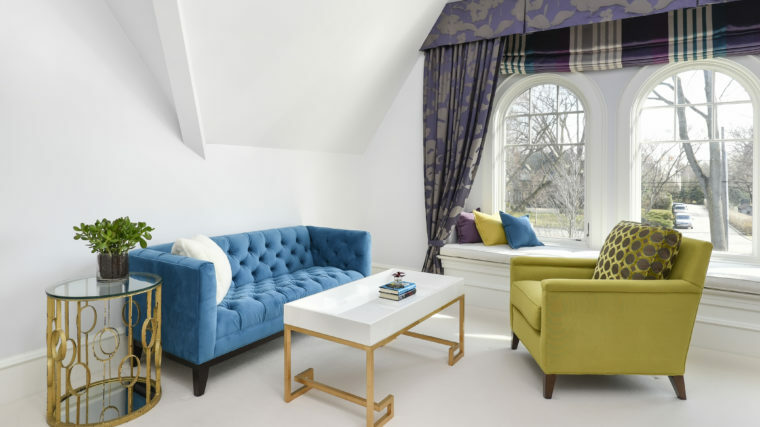 Chocolate velvet fabric was added to the pair of Ebanista sofas, while an Oscar Isberian lattice rug adds color and pattern to the room. 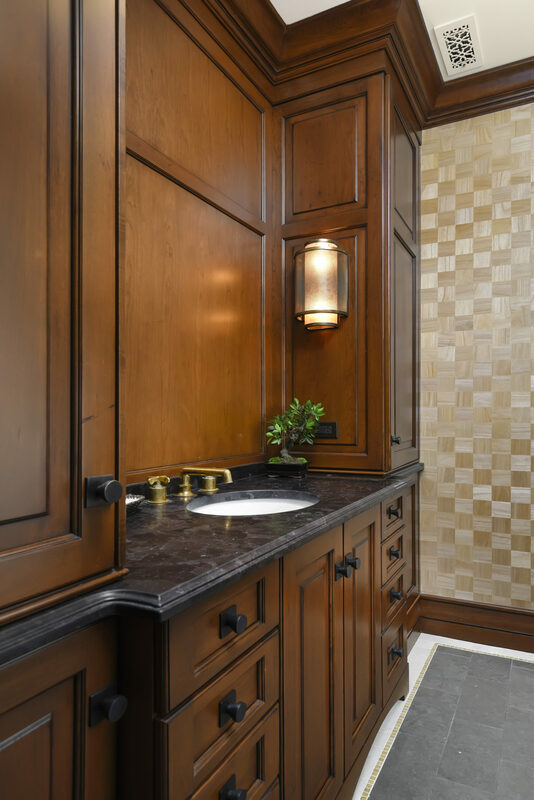 Bronze light fixtures by Urban Electric & Ilex tie into the bronze accents found throughout the room. 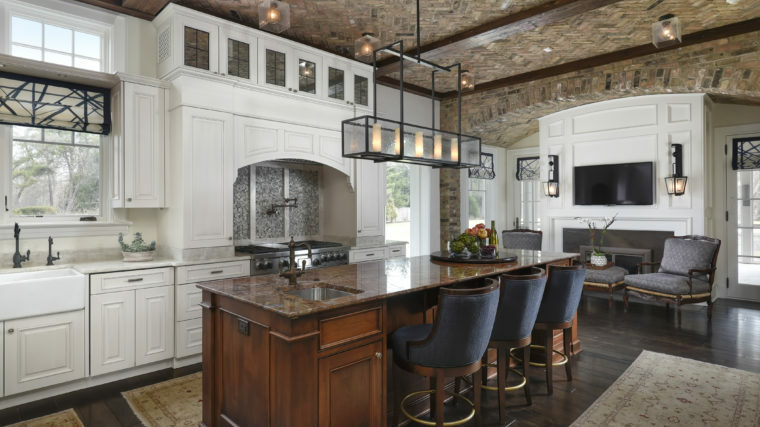 Morgante Wilson Architects designed this kitchen with an exposed brick and beamed ceiling. 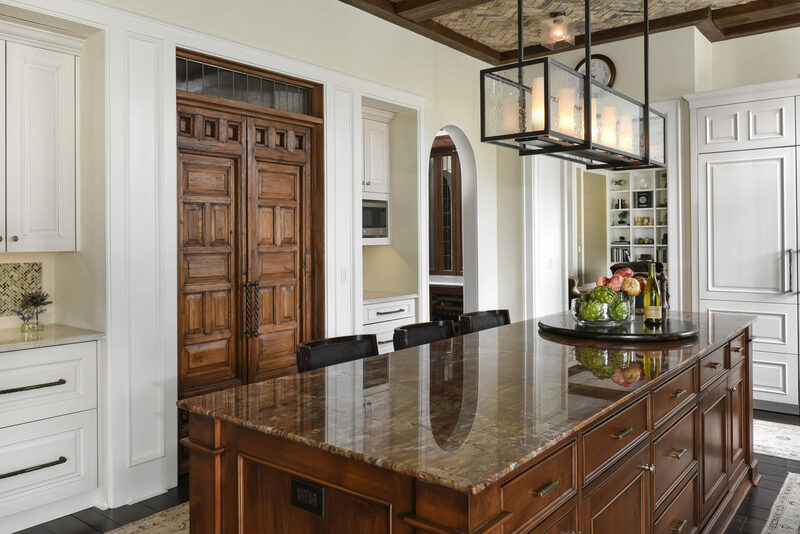 The bronze light fixtures from Urban Electric and window treatments made from Kravet fabric add additional character to this detailed space. 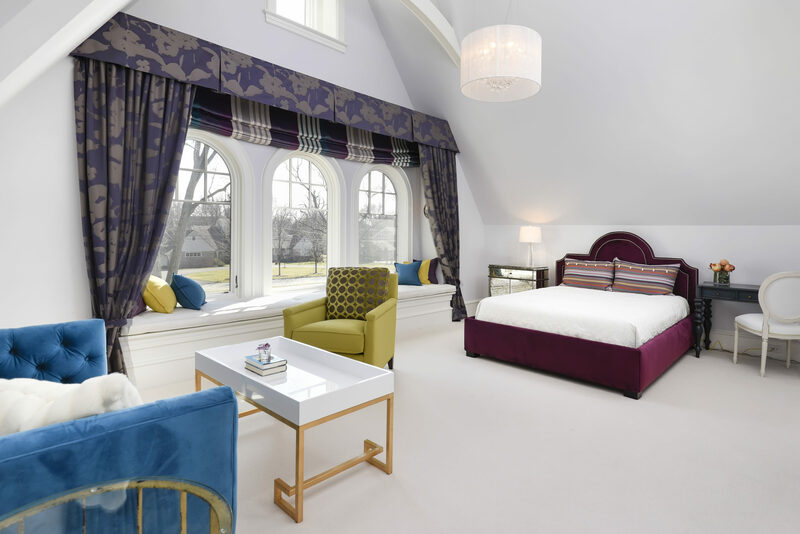 The cozy four seasons room was created with the use of a wooden coffered ceiling, tall windows with transoms above ensure unobstructed views of the yard. 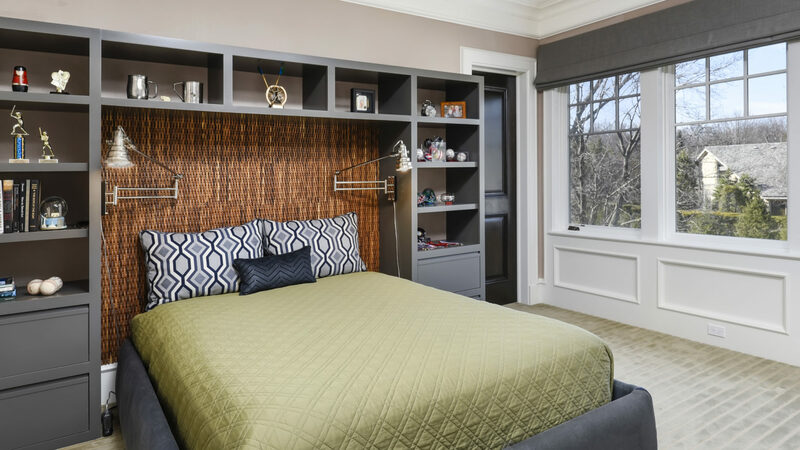 Fabrics from Donghia, Jim Thompson and Knoll add additional texture and warmth to the space. 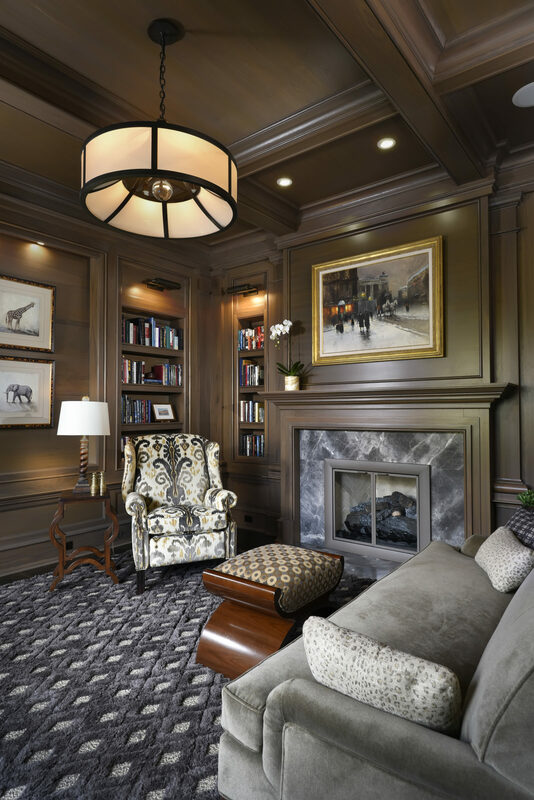 A wooden coffered ceiling was designed to complete the fully built in feeling of the home's library, a shag Hokanson rug and lounge chair covered in Schumacher fabric add warmth to this spaces that invites you to enjoy a good book. 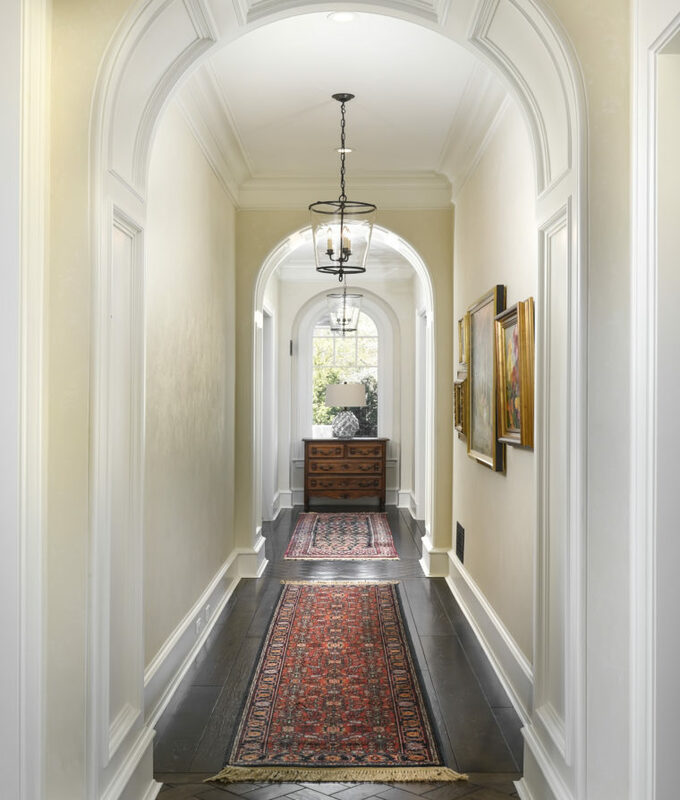 The grand hallway was designed with wood herringbone inlay to break up the length, paneled arches add traditional flair and embracing the Vaughan pendants that add a modern take to traditional pendants that accentuate the homeowner's antique rugs and artwork. 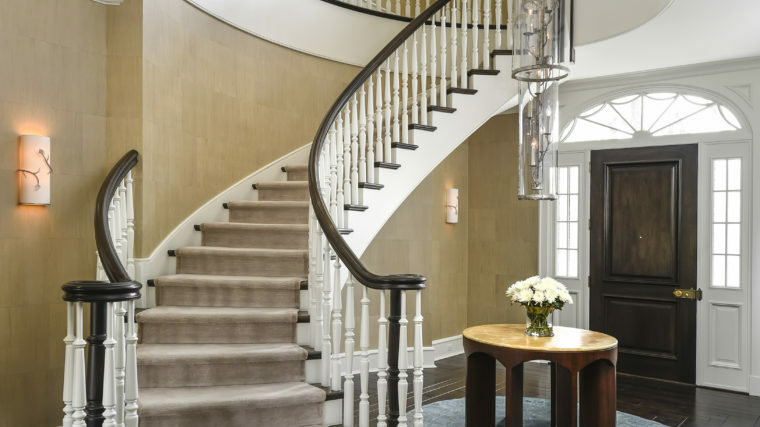 A neutral de Gournay mural was installed to provide the perfect backdrop and allowing the detail of the chairs to be front and center, a rock crystal chandelier coming from the lighted domed ceiling adds additional drama to this inviting dining room. Stained bead board accented with navy paint to make this mudroom a casual yet kid friendly place for backpacks and jackets to be stored. 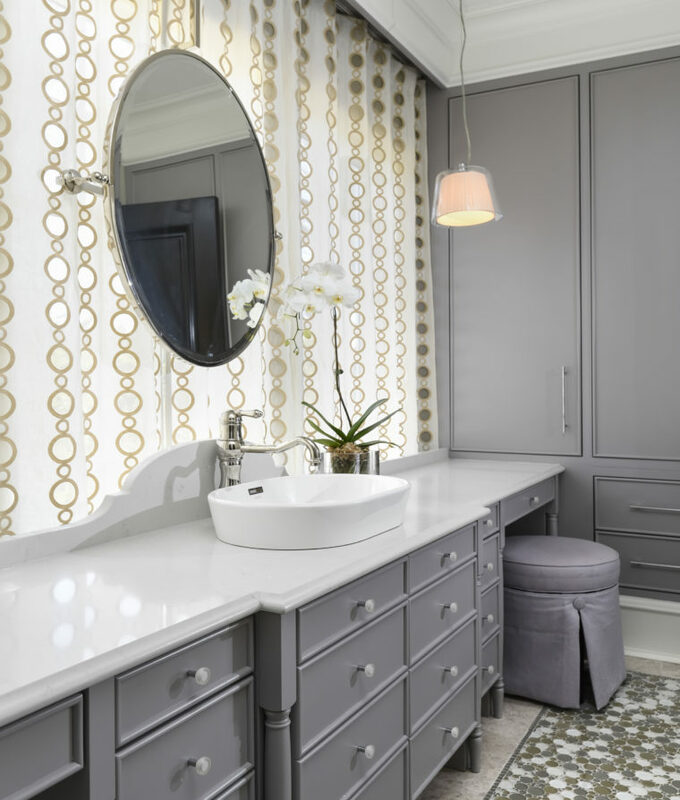 Anne Sacks tile was used behind the vanity to add glamour to this Powder Room. 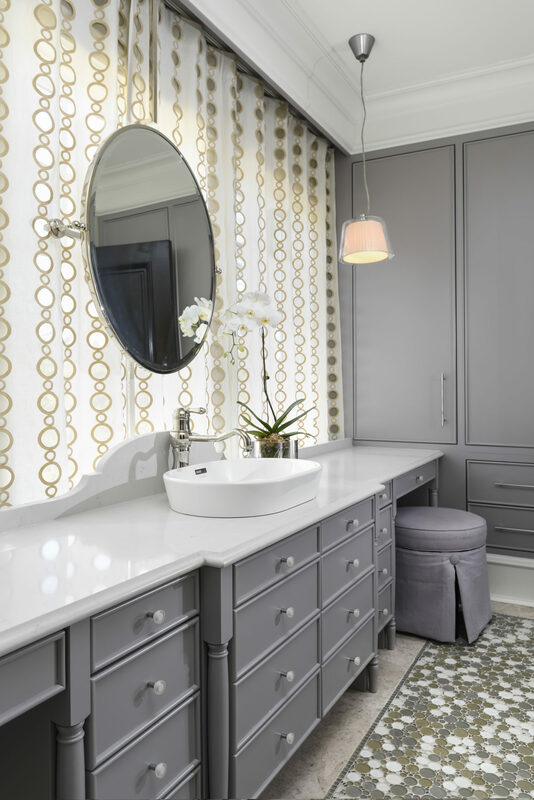 The THG faucet is in polished nickel to add even more sparkle to this spectacular Powder Room. 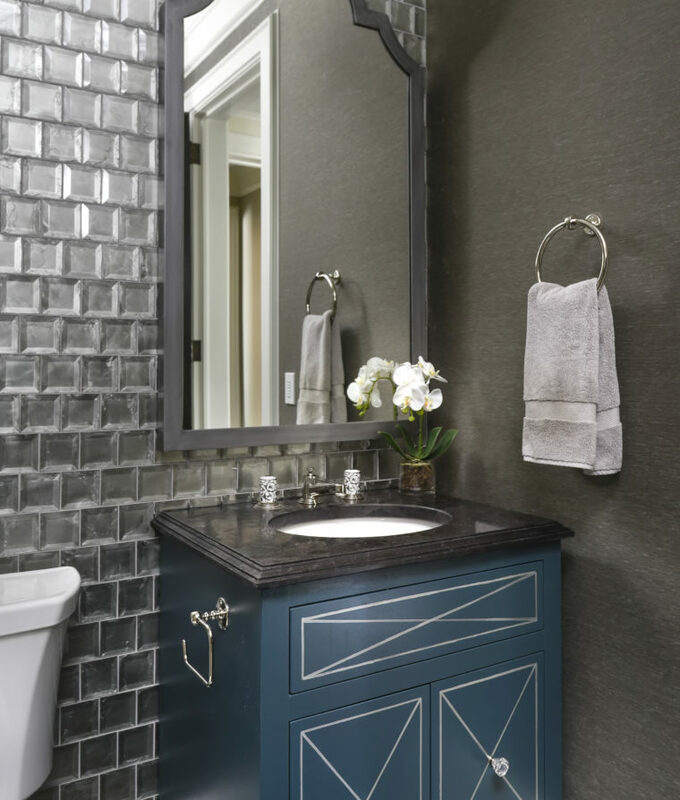 The suite is completed with his and her baths, a dark counter enhances the masculine appeal of his bathroom. 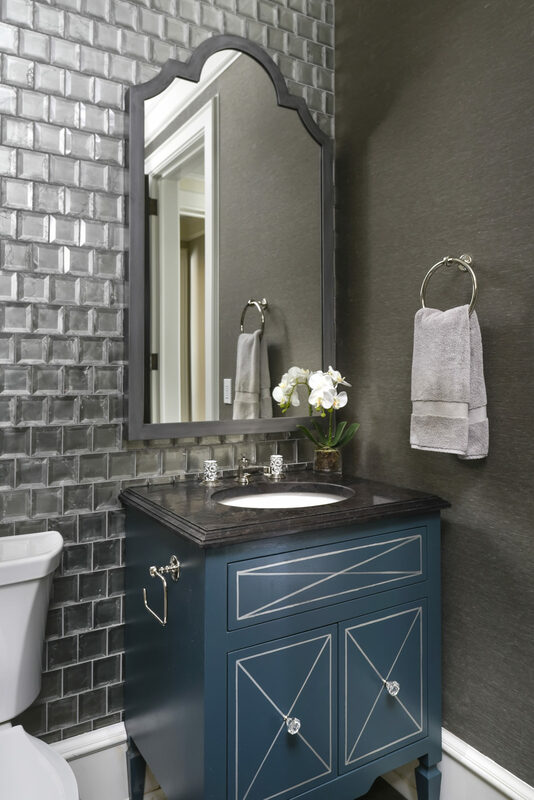 Bronze Hammerton fixtures and wood veneered Maya Romanoff wallpaper add additional layering, a Waterworks faucet brings additional appeal to the space. 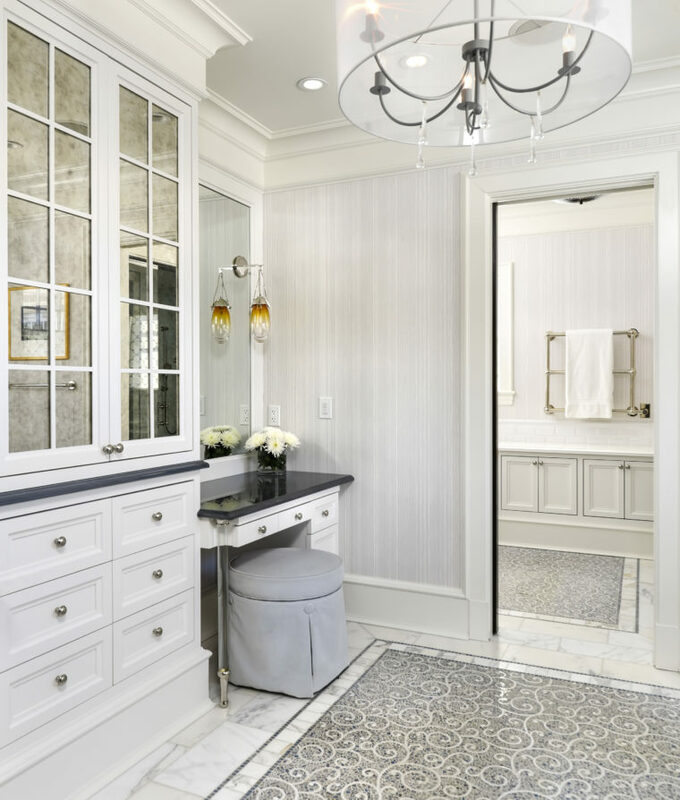 While her bath features, custom mosaic Waterworks tile floor. 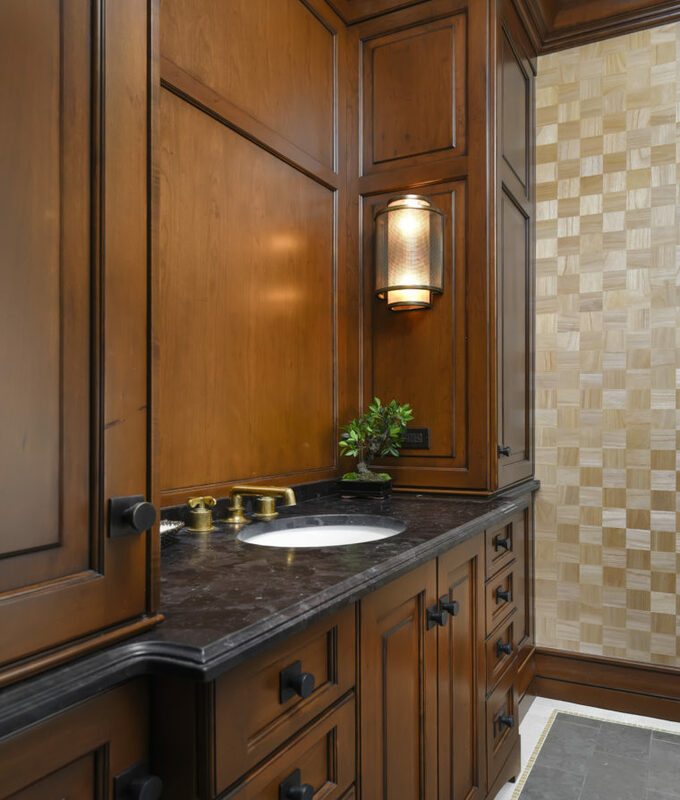 Custom cabinetry hides a TV behind the upper doors which incorporate antique mirror. 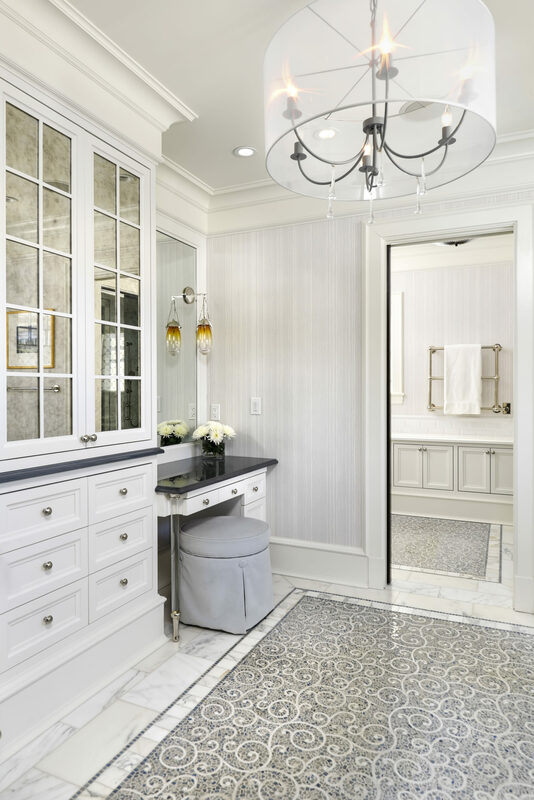 The addition of Romo's Travertine wallpaper allowed for more texture and durability. 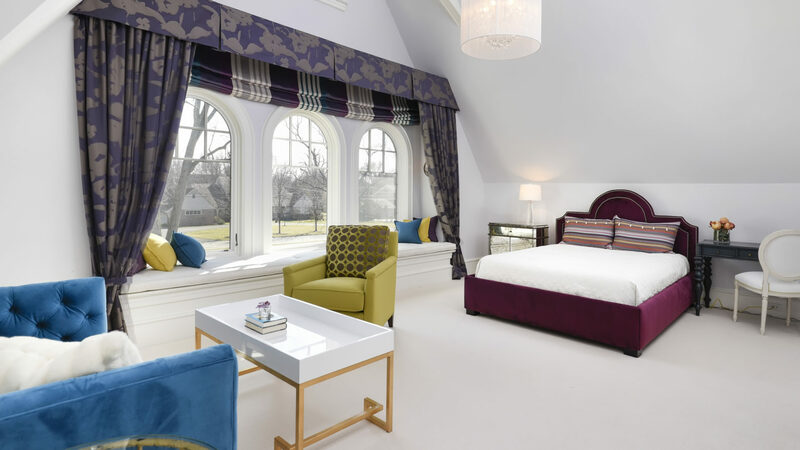 Morgante Wilson Architects enhanced the dramatic cathedral ceiling with tall floral draperies that enclosed the custom window seat. 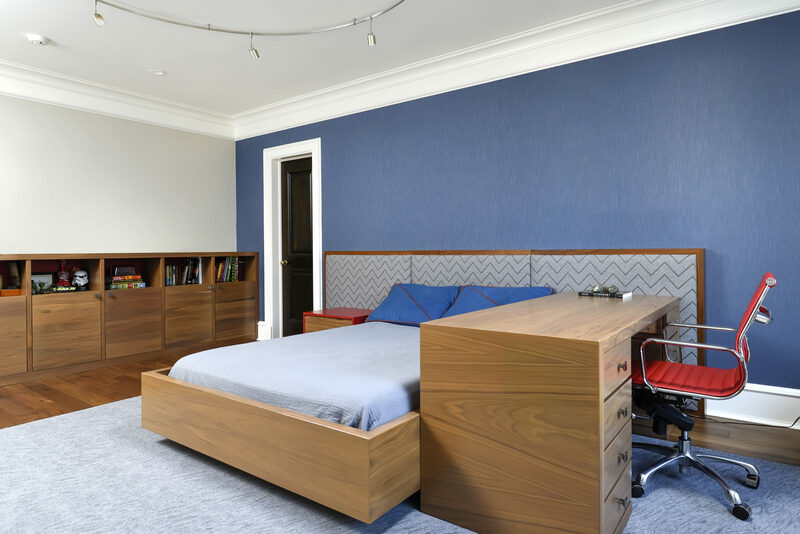 A mixture of jewel toned fabrics allow for the right amount of punch to one of the teen bedrooms. 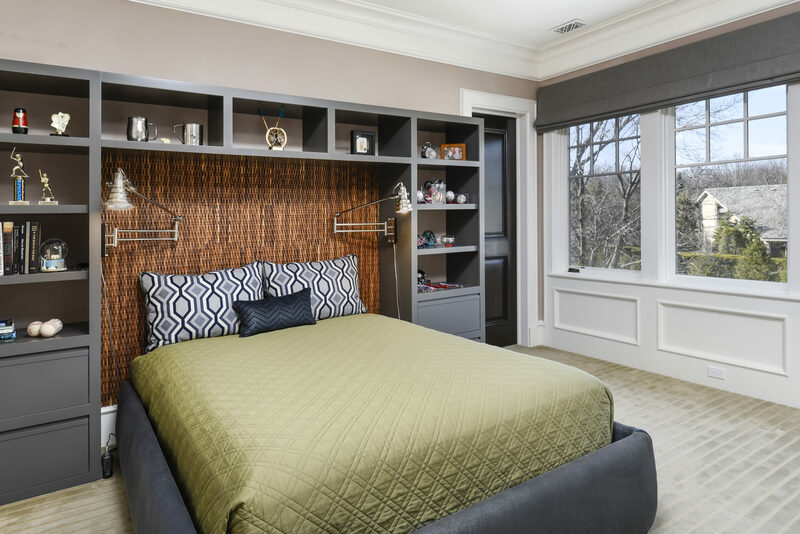 The other bedrooms were personalized with built ins that allowed for organization and display spaces for the younger residents of the home.